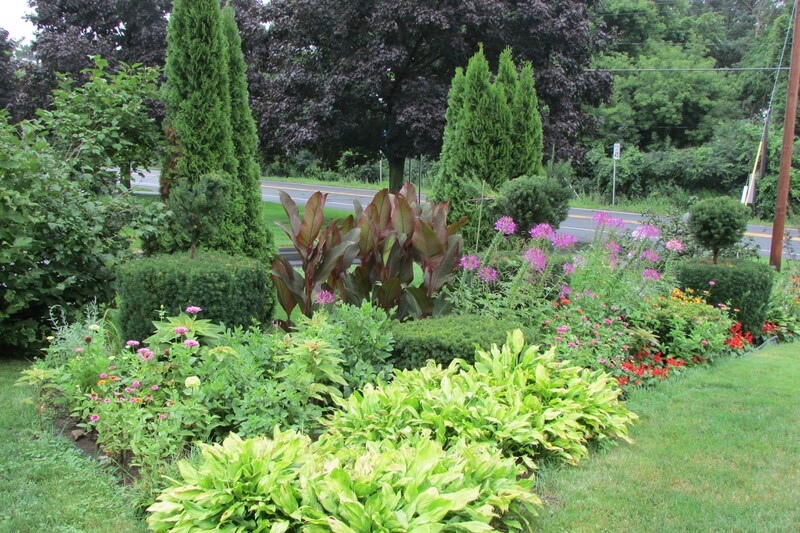 A view of the front garden at Whimsey Hill House, looking toward the road. Gardening has always been my passion or some would say one of my obsessions. My interest love of gardening, I think, was the result of three different people’s influences. My first person of influence was my maternal grandmother. Every Sunday we went to her house and she was always showing us what was blooming that week. Grandma had an old Brownie camera and almost weekly, wanted us to take her picture next to what was the most showy blooming plant of that moment. My second person of influence was my mother. Every weekend while visiting grandma’s place, my mother would go through the pile of plant material that grandma pulled out or divided, bagged it up and we took it home. Every Sunday evening, after we returned home, mom would have me help her plant the things in our back yard garden. My third influence was my father. My father grew up on a farm and as a child never went on a vacation; as an adult he wanted to see America. Two of the many places that he took us were Mount Vernon and Colonial Williamsburg in Virginia. Seeing those garden fascinated me, and I thought, when I grew up, I would have something like that. Little did I know, as a young kid, that not one, but many people tended those gardens. This blog post shows the current results of how childhood experiences and a hopefully healthy obsession turned out. In this post you will see how my garden looks now, after what has been the 2016 rehabilitation of some of the beds and borders. I hope you like my little tour (click on photos to enlarge). 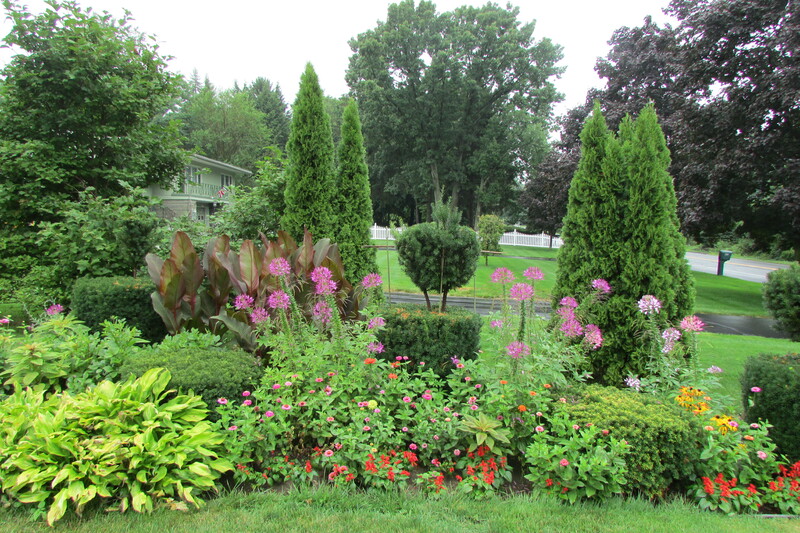 The cover photo for this post and the above shots show the garden, out front, that borders the driveway to my house. This year has been hot, with many days hovering around ninety degree. 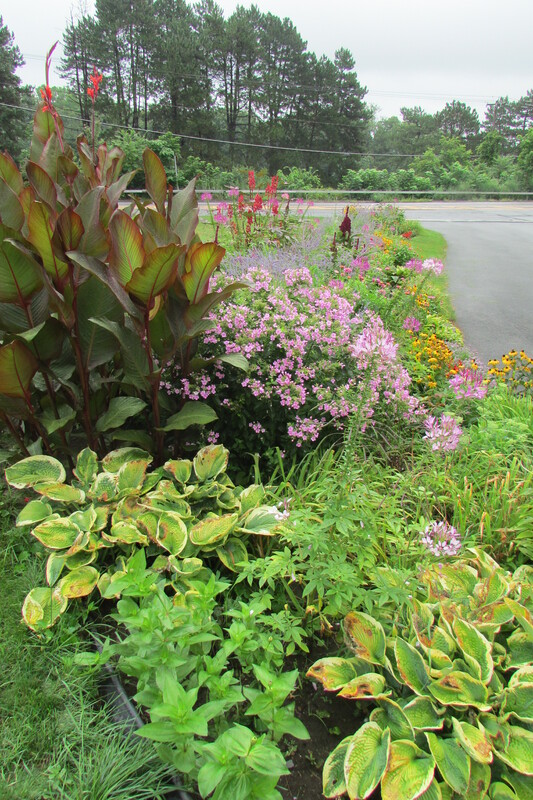 With this border getting full sun from early morning until late afternoon, it has been hard on the plants, no matter how often I watered them. 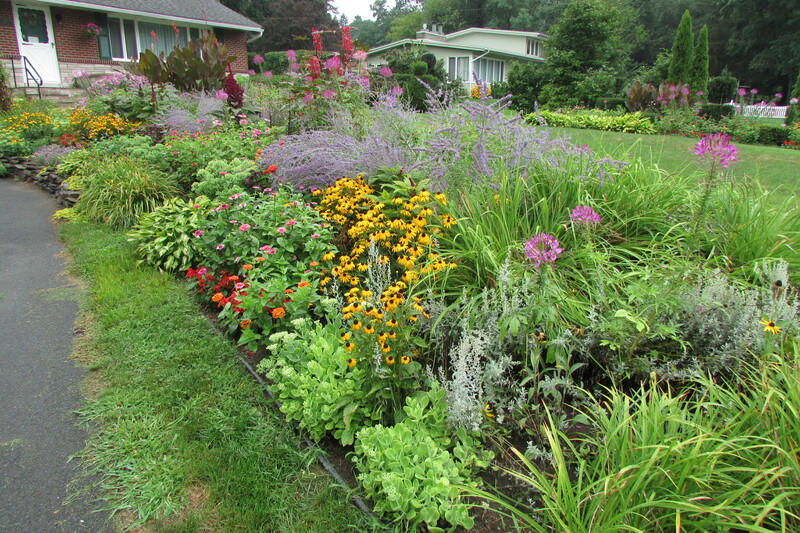 From the photos you can see that I’ve planted red Salvia, but I initially had many more. It seems that the plants that were most exposed to the harsh light and heat of day burned out and died, whereas the Salvia that got some shelter from taller plants lived. 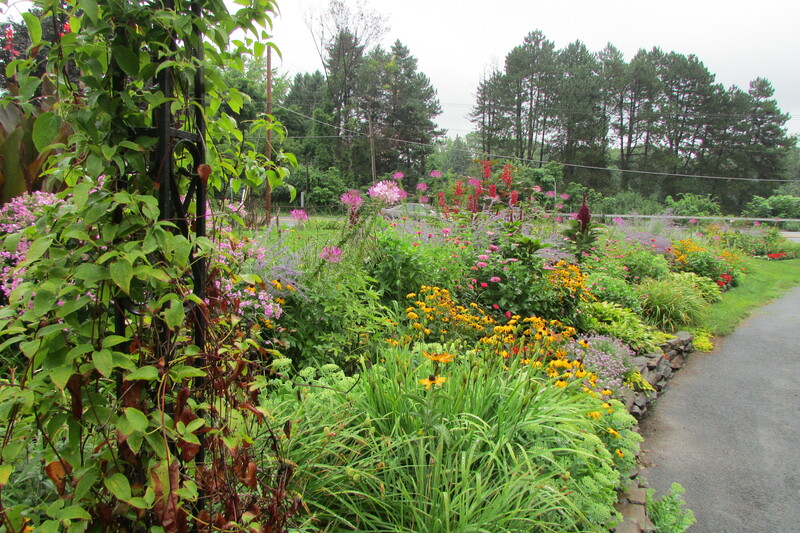 On the overall the garden still looks good, even thought many of the earlier blooming summer perennials have passed. The above two shots show the garden space, out front, that borders my neighbor’s property on the north. This year I’ve eliminated about six feet of the back side of the bed, closest to my neighbor, to cut down on the amount of planting that I have to do; I’m happy with the results. 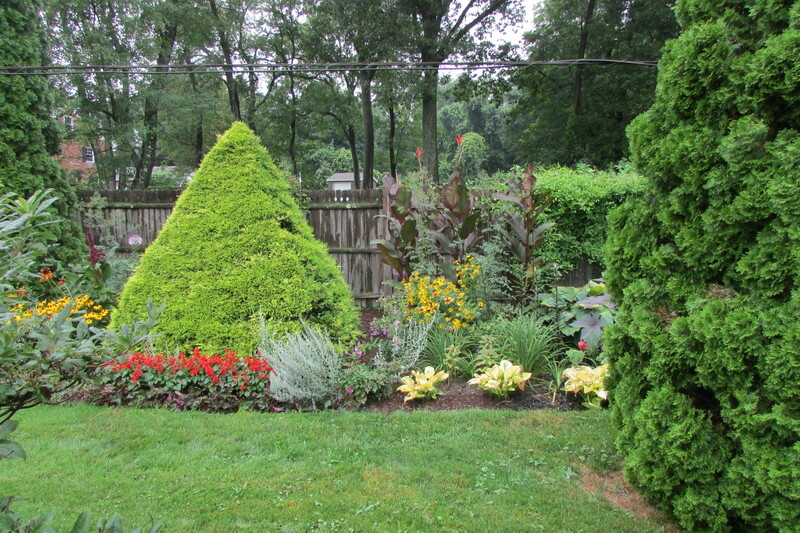 If you look closely at the evergreen bush in the center of the bed, it is a work in progress that will eventually become a peacock topiary. 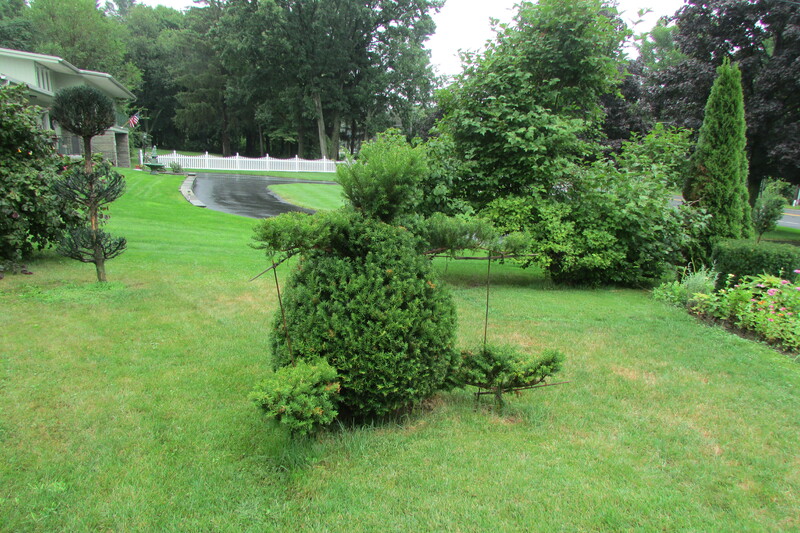 The above photo shows a bear topiary that I’ve started from a cone-shaped yew. What you are looking at is about four years growth. I hope in a year or two it will be more refined, but even now people see what I’m going for, without me telling them what it is. 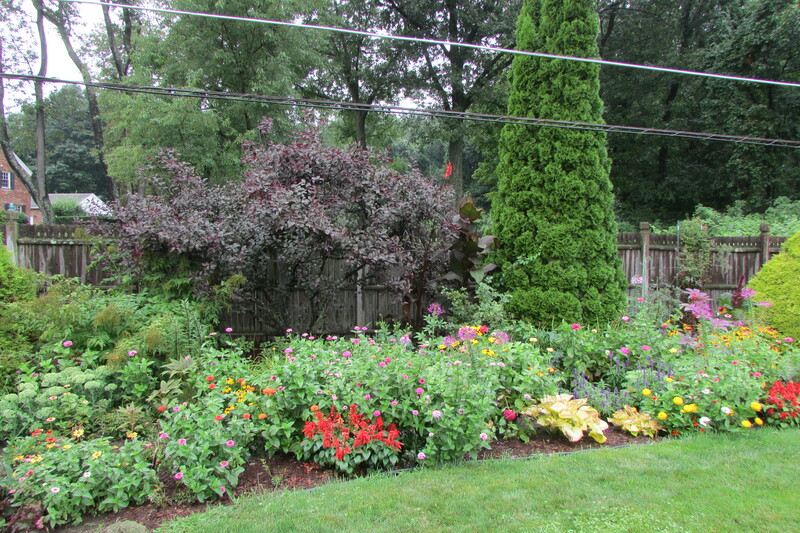 Now we’re out back, the above photos show the southern corner of the garden looking north. 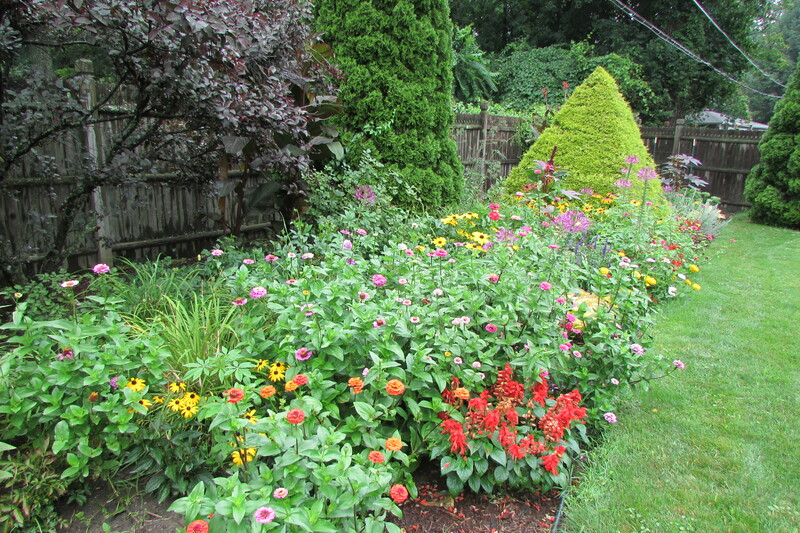 This year I started, from seed, every kind of zinnia imaginable. I bought over sixty-five dollars worth of seeds, and still had room for a few more plants if I had them. I like zinnias because they easily grow from seed, they are great for indoor arrangements, and they bloom right up until the first killing frost. Looking at the photos you will also see cleome and amaranths that self seed; I plant them throughout the garden were needed. The above photo shows some of the cosmos plants that are growing in the garden (they are the fine leafed billowing plants on the right). The variety was labeled wrong. 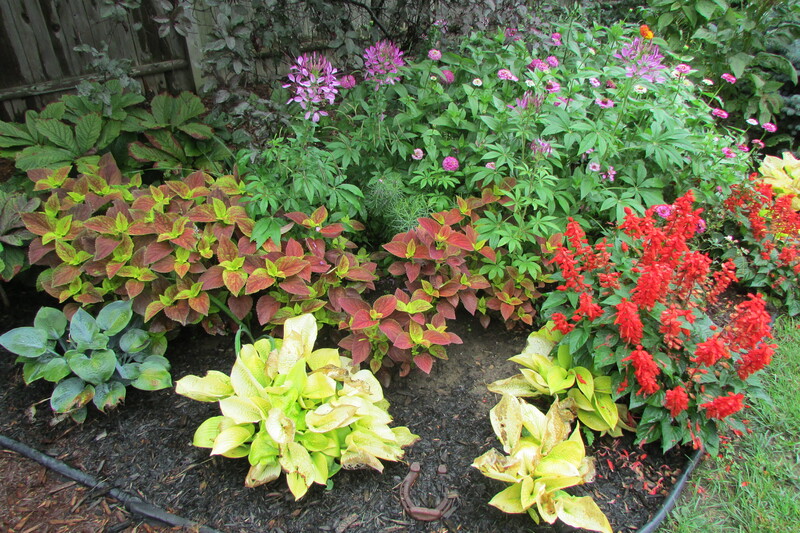 What I planted and what I got were drastically different. The labeling on the seed package said that the variety of cosmos would be in a ranges of colors from yellow to orange and that their height would be 18 to 24 inches tall. To my surprise they turned out to be an assortment of shades of pink and are 48 inches or more tall. In the background notice the large hosta, it is a Blue Angel. More zinnias and other flowers looking toward the north end of the garden. The north most corner of the back garden, which is a bit shady. The above five photos show the garden looking straight on at it as I walked from the south most end to the north. 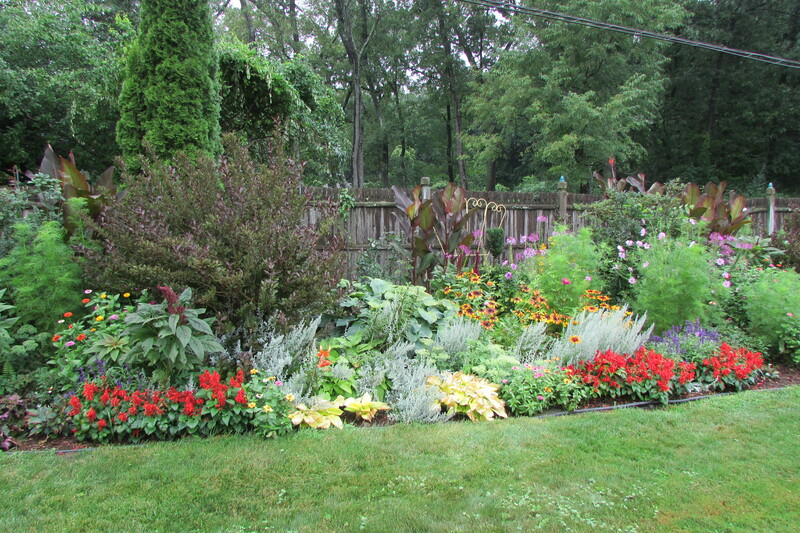 When I redesigned the garden I divided it into five equal sized sections and planted the same perennials in each section so there would be continuity. The plants in each section were not placed exactly in the same places in each of the sections, as that would be too repetitive. The above photo shows the space between the fence and the backside of the garden. 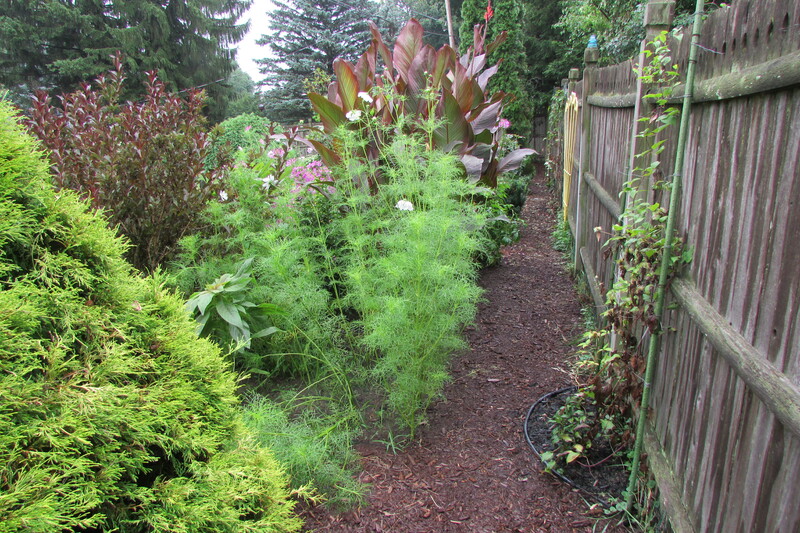 This year, to make it easier for me to walk behind and weed, I put down Dewitt 12 year weed barrier landscape fabric that is three feet wide and covered it with dark brown cedar mulch. I just love how eliminating the three feet of garden made it soo much easier to plant and maintain. The three-foot space also allows air to pass behind the plants and improves the look of the garden. After eliminating the three feet of garden space I wish I had done it twenty five growing seasons ago. So there you have it, a look at what has been completed so far. 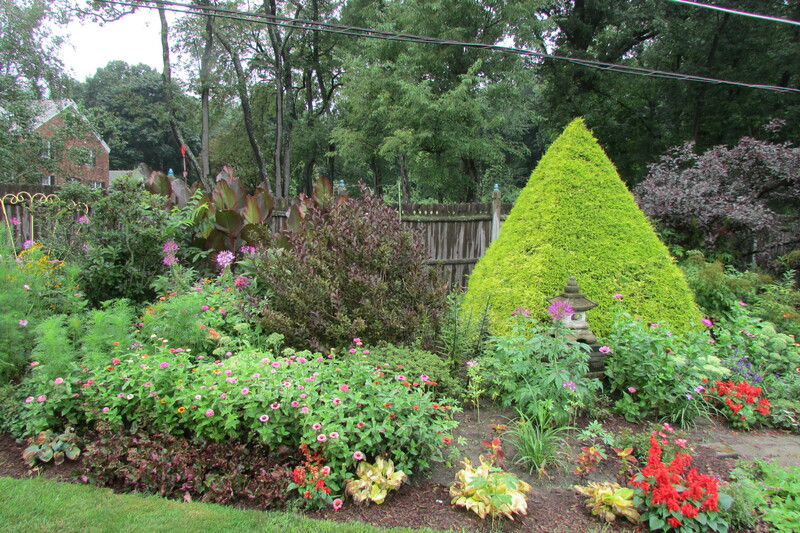 Have you decided yet if my garden is an obsession, a love, or just a lot of work ;-} The garden, no matter how much time it takes, and how hard the work sometimes is, I would have it no other way, at least at this time in life. 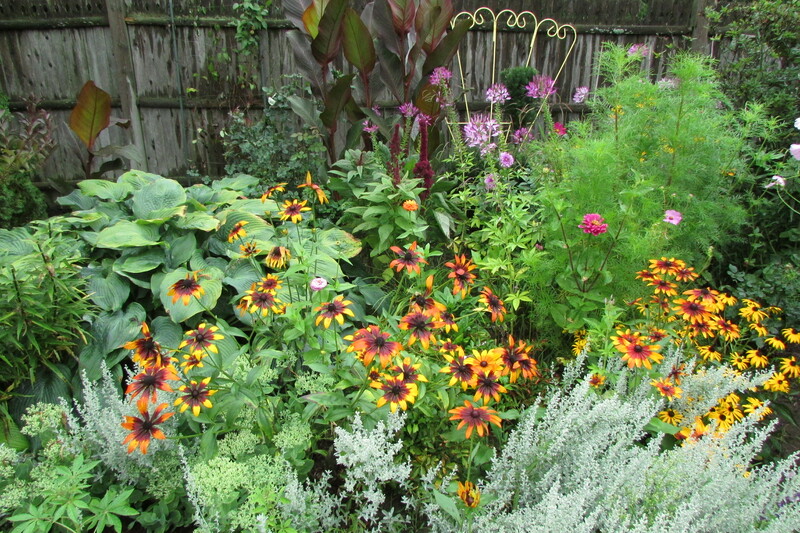 I have other garden spaces that still need to be addressed, and hope to be getting to them soon. This year has been all about the renewal of the grounds here at Whimsey Hill House, so stay tuned for the next part of the rehabilitation. Enjoy the rest of Summer, and Make it Last! This entry was posted in Fred's Garden at Whimsey Hill House, The Summer Garden. Bookmark the permalink. Lovely! And what a labor of love. The pink cosmos are my favorites and do not look discordant– I regret not planting cosmos this year, as they last well past Thanksgiving here. You have some gorgeous hostas, too, especially your large blue angel. Looks like you will have some diving to do shortly. 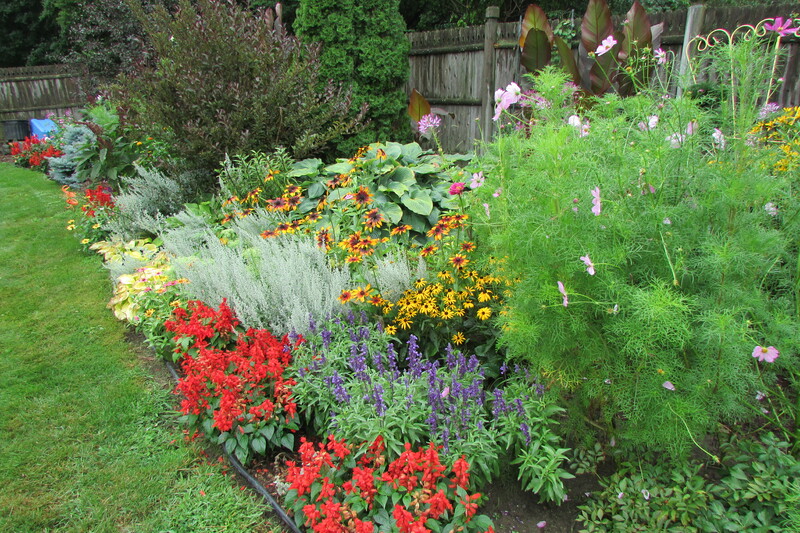 Your time in the garden has been well spent – creating a dynamic canvas this year! I wonder, do you use drip irrigation? Everything seems so well tended and evenly green. Hi there Suzanne, no drip irrigation, just an oscillating sprinkler that I move once each hour to different parts of the garden. 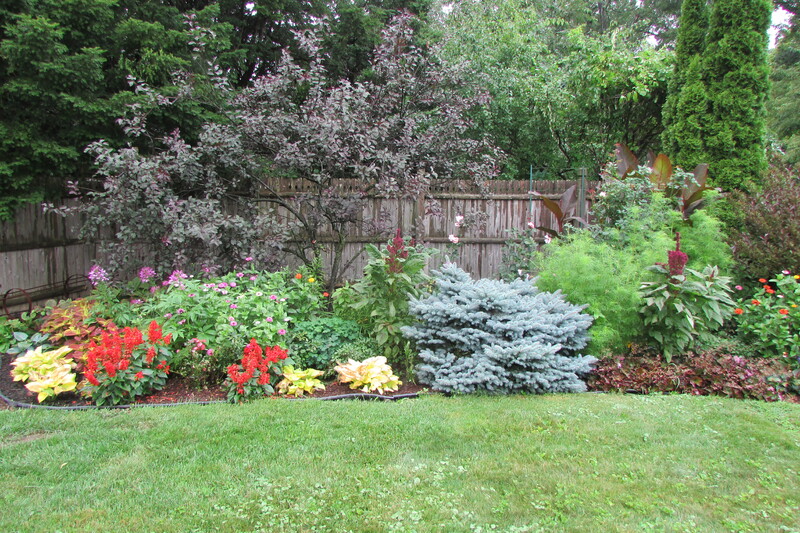 Yesterday was just the right time for me to photograph the garden, it had just rained and the sky was a bit gray. I’ve taken pictures a few other days, but the light was soo bright and things looked to harsh. This summer has been dry, but about a week ago we had about five inches of rain over two days that hydrated everything. The lawn is looking a bit better, as the drought dried out the lawn and made it crunch when it was walked on. 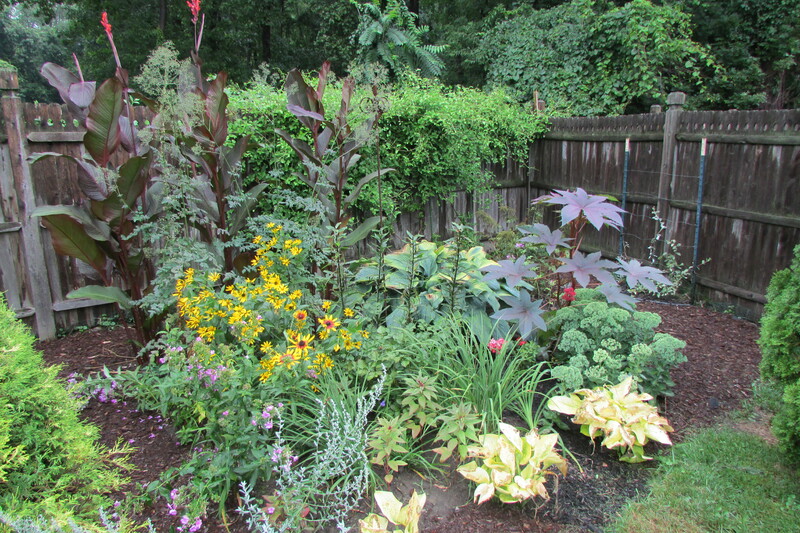 The garden has been divided in many places, all of the annuals that I’ve started from seed, and the dahlias that are about to bloom and the cannas that are in the beds make it look fuller than it really is. Suzanne thanks for your comment, enjoy the fleeting days of Summer! Lovely, lovely gardens! Thank you for sharing. Lovely, as always dear friend! My yellow “Gonsowski” lily is always the showiest in our Windy Ledge garden! Unfortunately, the intense heat and lack of rain has shortened the life span of many of our plants as well, especially our cleome. Keep Cool and enjoy the remaining Summer days! Hi there SLR, hope your are liking loving your retirement. I’ve been having work done here at the house, you and the mister will have to come see how it turned out when it is finally done (almost four months of living in a “disaster zone”). Fred….i am loving your obsession, compulsion, addiction…WHATEVER! Its inspiring to someone like me just starting out. What is the unique pyramid shaped evergreen in the back garden? Is it a topiary or does it grow naturally in this way? I am enjoying the last of sumer days in the hudson valley but eagerly anticipating fall and holiday decorating as well. Keep the great posts and photos coming….I look forward to them all. Hi there Su, they are golden String/Thread Cypress, if you have a moment look at the blog post I wrote on how to trim them it’s titled is How to Trim a Golden String / Thread Cypress into a Pryamid I also wrote a post about growing a topiary it’s title is Growing a Topiary from an Upright Yew. Tonight while typing this note to you, I am thinking about my mother. Sometimes she says “You have Too many flowers”, my comment to her is “Ma, it’s all your fault, You were the one who taught me how to plant and what was a weed”, she them makes a face, and we both laugh. You wrote that you live in the Hudson Valley, so do I, I live in the Capital District. Have you ever heard of Trade Secrets, Ct, it’s in Sharon, Ct. A lot of people from the Hudson Valley go to it. I wrote a post on it, it’s called Martha was there and so was I, Trade Secrets Ct, Sharon Connecticut. 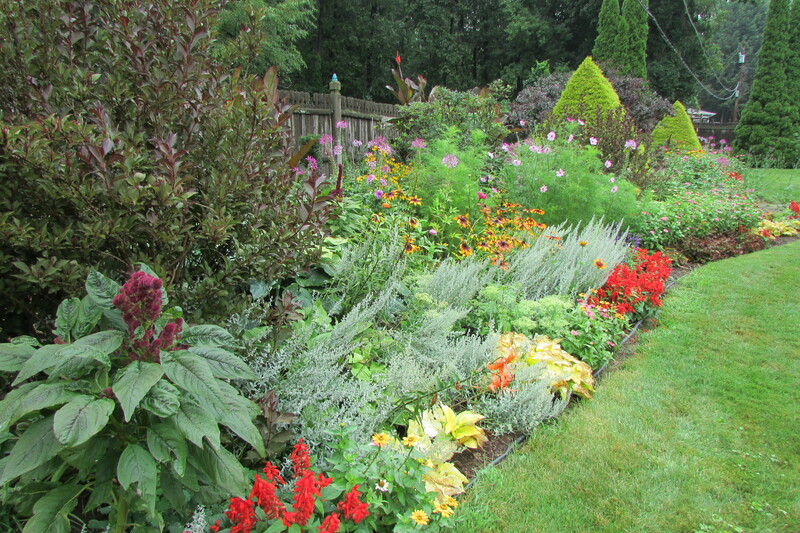 Trade Secrets is one of the highlights of the gardening season for many people. It is a rare plant and garden antiques show that is attended by a few thousand people on the Saturday and Sunday after Mothers Day. 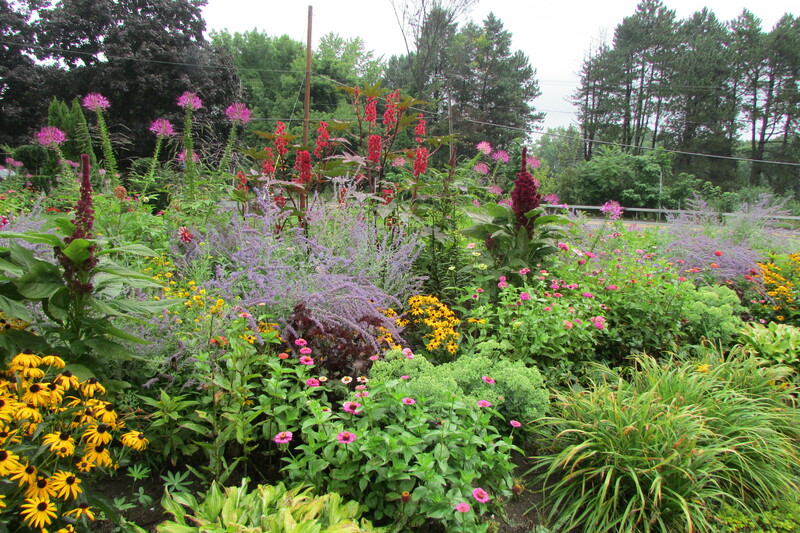 There is also a garden tour that goes with the event. Thanks for your comment, if you want to see other articles I wrote on gardening, look at the categories on the right side of the screen. Look at articles under the Spring, Summer, Autumn or Winter garden, there might be posts that inspire you. Such beautiful photos of lush greens, varied textures and bright pops of color! Makes me miss my garden in the South. We moved to the Rocky Mountains a few years ago, and gardening is a much different experience here. Thank you for the reminder of what it can look like when one devotes many years of hard work (along with your talent and taste) to shaping the land. Hi there Heather, I have friends who moved from New York state to Florida, and they are finding it a challenge to garden, as they really don’t know what works in different levels of light in their new area; so I know kind of what you are up against. Thanks for the pictures! They are inspiring as I landscape my property. I notice you have utility wires around. I do too on my lot. Any tricks to trying to make them blend in? Fred, I don’t know why I didn’t get this gorgeous post of yours! I saw your name on Pinterest and thought to myself that I haven’t heard from you in a while, so I looked you up, and THIS is what I have been missing! The most glorious crescendo of gardening and I am late to the party! Well I am here now and you have outdone yourself with this year’s garden! 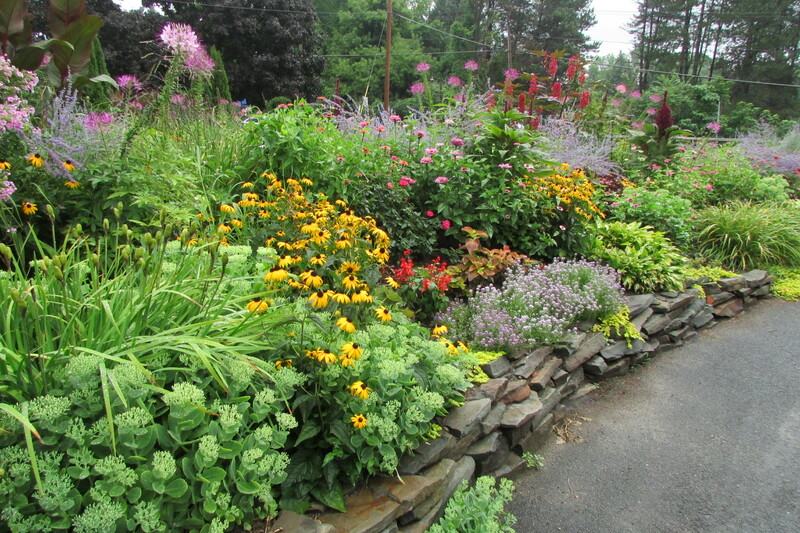 My favorite part is the garden along the driveway. What a wonderful sight to see as you arrive home, or for people coming to visit, or just driving by! Hi there PW, I’ve been really busy with the garden, it is fall cleanup time you know and a lot of it has been rehabilitated this year. I also have other responsibilities that give me little time to write posts at this time. I hope to soon get back to it when things slow down a bit for me. A lot of people daily see my garden, I live on a major road that George Washington once traveled on. I live in an area that is country by the city with the Indianapolis Speed Way going right in front of my house. I love seeing the movement of life going by, but don’t want to know the people in the cars. Thank-you for all of your lovely writings and pictures. I found your website when looking for advice on hanging curtains, and I have been going through you posts savoring the information, and learning so very much. Thanks again! Hi there Beverly, thanks for your lovely comment. To see all of the interior decorating posts that I’ve written, look on the right side of the screen. Look for the word categories, and under it are different decorating titles of the topics that I’ve written posts on; there might be something there that interests you. Click on the topic title and you will see all of the different articles that I’ve written on the subject. Interior Decorating Principles has all of the different posts that I’ve written.